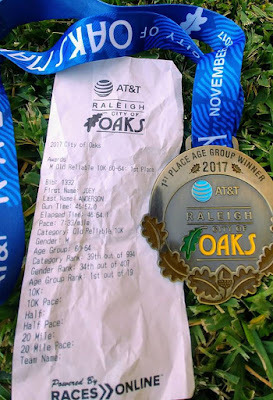 Other than the sponsorship I assume for the Old Reliable run, the race really doesn't have anything to do with the old Old reliable run and nobody seems to relate to it other than as the City of Oaks 10k. Even my award medal just says City of Oaks. Oh well, enough of that. Important thing is that I won. ! The End. Ok, a little more then. It looks like a near perfect morning for it other than 100% humidity but with the temperature at 50 degrees that wasn't a problem. I arrived in plenty of time to make my way over to the bell tower area. Talked to a few friends and then headed out with 30 minutes to go for a warm up mile as usual. I usually like to get in a few strides about 5 to 10 minutes before the start but it was pretty crowded and with 3 races starting together I made my way near the front so no chance for them this time. I looked around but didn't recognize any of my age group regular competition but I did see a couple that looked like they probably were. But I can't race the unknown so I just focus on running my best and see how it shakes out at the end. The first mile is mostly a nice downhill except for a short steep hill on Ash Ave. I felt strong early and cruised right up it and then pushed down the backside. Even feeling good I was surprised at how easy the 1st mile was in 7:06. I expected maybe 7:25-7:30 so that was a boost and it was game on. The course continues with more gradual downhill along Western Blvd before turning UP onto Boylan Ave. Its quite the nasty hill and I just put my head down and maintained effort. 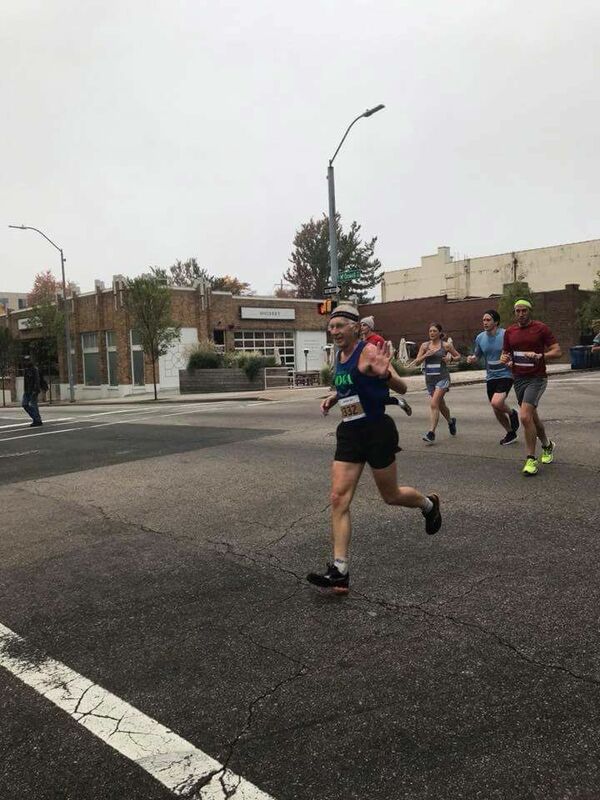 I passed mile 2 in 7:34, so I still had a cushion on my fantasy finishing time of 46:30. My realistic goal was 47:30 and really on this course I figured sub 48 would be awesome. It was nice to see former co worker Molly volunteering at the summit soon afterwards. The next mile would be more rolling hills but nothing as tough as the one just behind me. I was locked in and feeling great ! Mile 3 was another 7:34. I saw NCRC friend Johanna working as a monitor there and she snapped a picture for me. One of the cool things about racing in the hometown area is the number of friends either volunteering or racing. I enjoyed hearing my name called out all along the course and I was doing a lot of waving ! The next mile climbs up to Fayetteville St and then flattens out for the next mile. With all the people living downtown now I expected some to be out cheering but it was like a ghost town through that stretch. Finally had some good cheering as I ran past Runologie. Good support from that group ! I was hoping for a little better time but it was still a decent 7:30 but although I was very pleased to still feel good I knew what was coming. The climb up Clark Ave is serious and especially when you are redlining at race pace ! The only good thing about it was the large crowds cheering that section with the parking, spectators and water station by the busy Cameron Village area. Lots of friends calling out and I tried to acknowledge them but I was hurting trying to maintain pace and I was making my death noises as usual. Mile 5 was 7:49. I was thrilled because I was sure it would be over 8 minutes. My fantasy goal was now lost but I was still looking at much better than I had hoped and a sub 47 was still a possibility ! 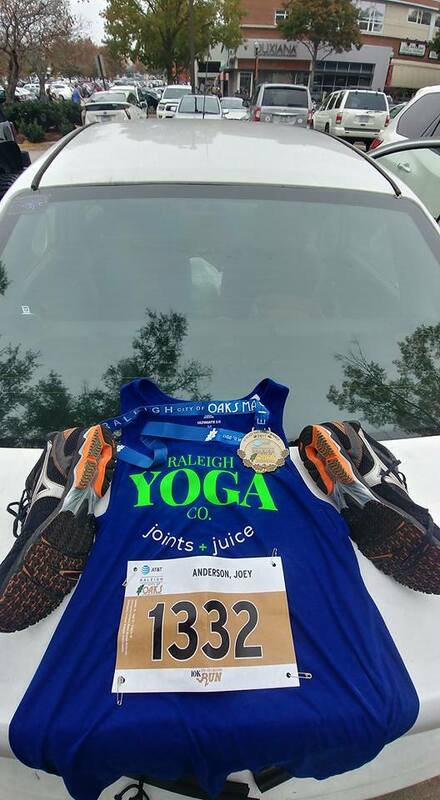 I continued to grind my way to the top of the hill and just at the summit and before turning toward Hillsborough a young guy in his 20's running in the 5k caught up to me and said I was awesome and I was his inspiration. I thanked him and then as we started down a slight down grade I passed him back ! Always good to hear these kind of compliments. I work hard at this stuff ! Now I was really digging deep. I wanted sub 47 but knew it would be close. I hit mile 6 in 7:47. . I went by the 3 mile mark for the 5k and knew there was one tenth to go, roughly 45 seconds at 7:30 pace. I just put the hammer down running on fumes now. And then Boom ! across the line in 46:54 at which time I immediately began dry heaving worse than I have in a very long time. I tried to move but had to keep bending over wretching. Several volunteers and a couple of runners ask if I was ok and each time I would heave and say yes I'm good ! Not sure they believed me. I was telling Laura later at yoga that I was was proud that at least this time I wasn't rolling around on the ground like I was gonna die like that time she tried killing me in a workout. After I finally was able to stop gagging I grabbed some water and made my way to the results tent. Woohoo ! 1st place. So mission accomplished. I had fun, got in a great workout and another win. This is getting pretty cool ! Stay tuned sports fans. Next up is The Magic City Half Marathon In Birmingham Ala. on the 19th, the next race in the Running Journal Grand Prix series.